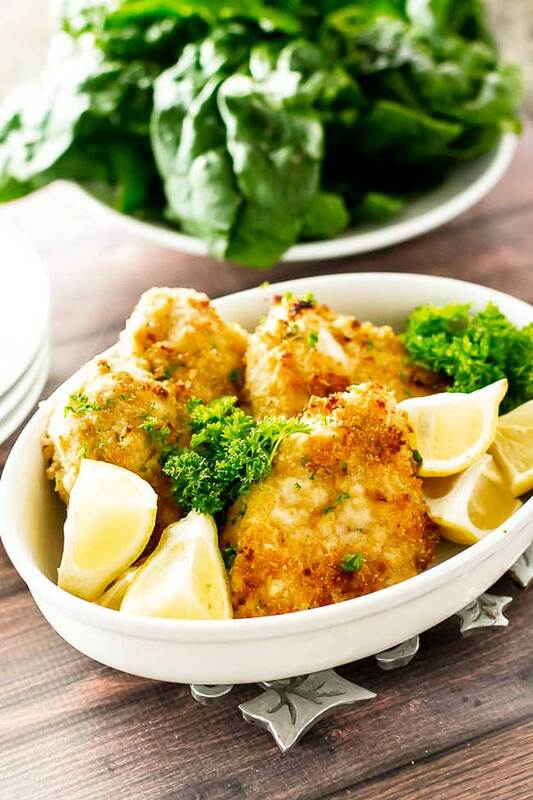 Juicy boneless skinless chicken breasts with a crispy oven-baked breadcrumb coating. 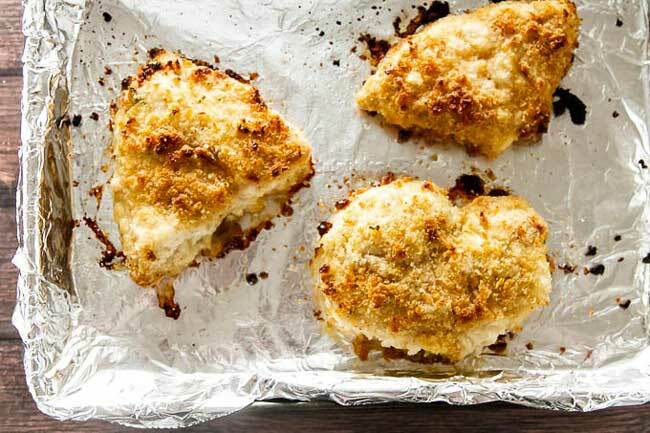 This breaded baked chicken is a weeknight go-to favorite. There’s one thing I always have in my refrigerator: boneless skinless chicken breasts. No matter what I always pick up a few each week at the store even if I don’t have a specific plan for how I might use them and, really, isn’t that the beauty of them? They’re so versatile, so easy to work with, and, if cooked properly, so delicious. 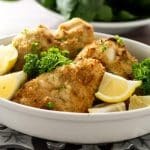 Sure, I love me some wings, and thighs, and chicken breasts with the bone in and skin on, but more often than not I turn to my trusty boneless skinless chicken breasts for weeknight dinner inspiration. In this installment of My Love Affair with Boneless Skinless Chicken Breasts (ha!) we’re coating them with a flavorful mixture of herbs, mayonnaise, and mustard and then dredging them in a combination of dried breadcrumbs and panko. I like to pound my chicken breasts before doing this for two reasons: first, it is the best therapy at the end of the day to take a mallet and beat the insert expletive here out of something and, second, it’s important that the chicken breasts are all the same thickness so they cook evenly. So, pound them out first, then coat with herby mayo-mustard mixture, and then give them a good o’ roll in the bread crumbs. See how nice and golden they are? This is what makes my heart sing when it’s dinnertime – these breaded baked chicken breasts look so wholesome and give me that let’s-gather-’round-the-table-for-dinner happy fuzzy feeling. I love that feeling. Thank you, boneless skinless chicken breasts. Thank you. In a small bowl combine the Dijon mustard, mayonnaise, and herbs and set aside. Next, place some cling wrap over the chicken breasts and pound them out until they are of even thickness, about one inch thick. Season them well on both sides with salt and pepper. In a shallow dish combine the garlic powder, bread crumbs, and panko. 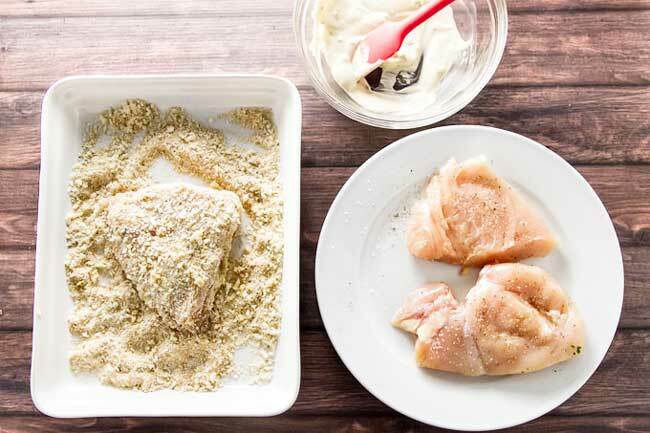 Coat the chicken breasts with the mayonnaise mixture and then coat them with the bread crumb mixture. Place them on a baking sheet lined with tin foil and drizzle each chicken breast with the olive oil (about a 1/2 to 1 teaspoon over each). Bake the chicken breasts for 20-30 minutes at 400 degrees or until the internal temperature is 165 degrees. Optional: in the last few minutes of the bake time turn the oven to broil and finish baking the chicken breasts, This will get you an extra crispy coating. Use any combination of herbs that you like. I used fresh thyme, some chives, and parsley because that’s what I had on hand. I used two very large chicken breasts (almost 1 pound each). After I pounded them out I cut them in half making four servings. This is similar to a recipe I’ve made any number of times and is so delish. I followed what you prescribed except that I always add either grated parmesan or manchego cheese to the panko. Ups the flavor all that more IMO. This was sooo good. I wasn’t sure about dijon mayo cooking. Boy was I wrong. SO good. Thank you. Breaded Chicken is the perfect go-to dinner! Love that you coat the chicken in mustard and mayo! That must give the chicken so much flavor! It does! So good 🙂 Thanks for stopping by Christin!